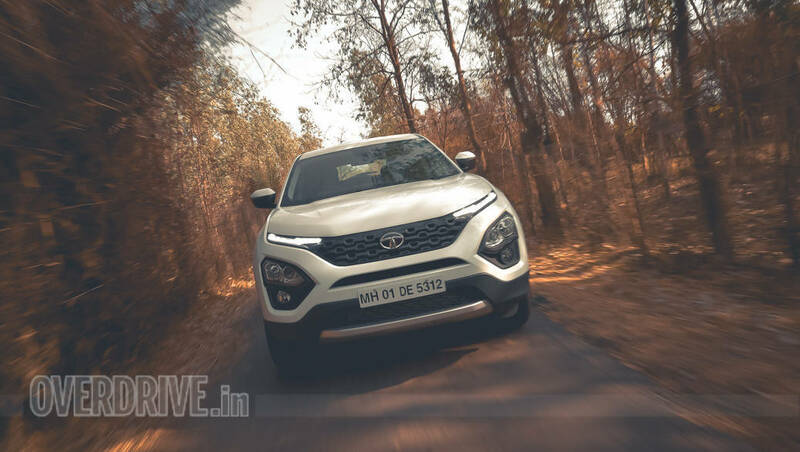 The Tata Harrier comes at a time when there's no dearth of options for anyone looking to buy an SUV in India. There's everything from small crossovers like the Hyundai i20 Active right up to performance behemoths like the Lamborghini Urus. But the Harrier's roughly Rs 20 lakh price tag means it finds itself at the deep end of this lot. 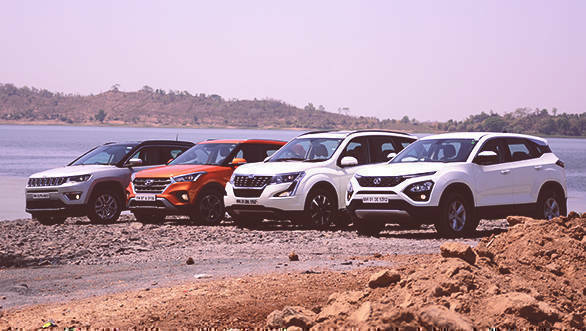 It's more expensive than the very popular Hyundai Creta but undercuts its closest rival, the Mahindra XUV 500 and the versatile Jeep Compass. 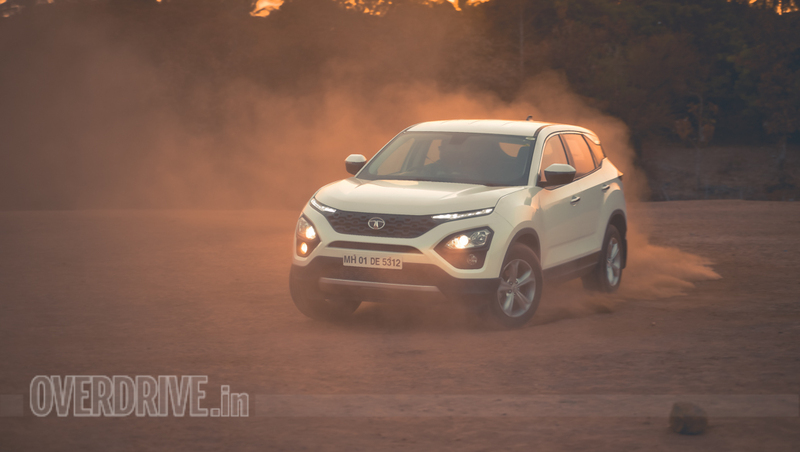 Tata Motors has thought this through though and packs its newest offering with the best chassis and engine components it could lay it hands on. This makes for an interesting backdrop for us to start evaluating where the Harrier stands when seen alongside its closest rivals. The Harrier is the longest and widest car in this comparison. And also the most imposing. It grabs attention instantly with its two-part headlamp design and its size. I personally like this look but from certain angles, the Harrier can look a bit disproportionate. The prominent haunches, the floating roof that becomes pinched after the C-pillar, the very organic rear tail lamps are attention grabbers. They add volumes to the presence but the effect is slightly diluted by the small 17-inch tires and plain-looking alloys. The XUV 500 is the tallest and a close second in length and width. It is also the oldest SUV here but Mahindra has regularly updated various elements to keep it looking attractive. The many facelifts have helped but the busy styling with its many cuts, creases and bulges still stick out here. The new tail-lamps at the rear are a nice touch though, helping it look slightly less top heavy. 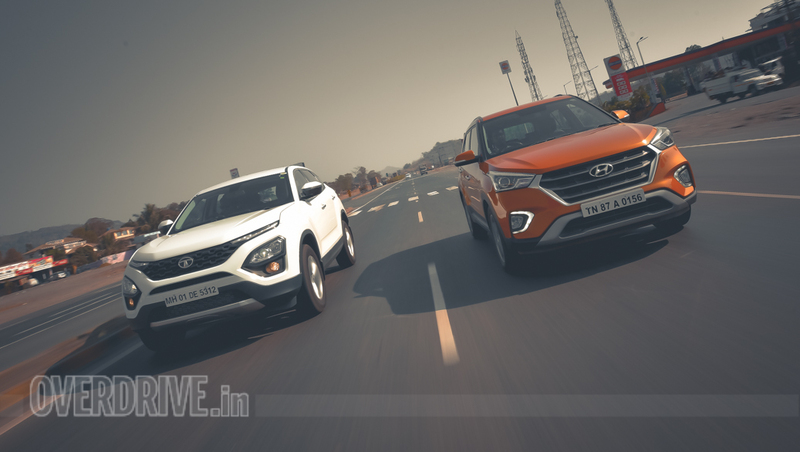 The Jeep Compass and Hyundai Creta, conversely, follow a slightly more conservative path. The Compass brings iconic Jeep design cues like the seven-slat grille, the flat squat look, and squared-off styling, to a compact package. This makes it the most balanced of all the cars here to look at, with all the aggression expected of a Jeep. The only let down is the 17-inch wheels on the Limited trim we tested, the 18-inches on the Limited Plus look much nicer. The Creta is the smallest car here but again finds it easy to pack all the traditional SUV design traits into this small footprint. We like the big grille that the facelift brought with it and the overall simple look, which still manages to stand out. But fatter tyres and maybe a contrast roof would have been nicer. The Compass has a distinct edge here. All the buttons are within easy reach, feel tactile and have an air of quality unfelt in the others. The grey soft-touch dash is well contrasted with the comfortable ivory leather seats with a red stitch grabbing attention. To top off, the 7.0-inch Uconnect system is crisp and the easiest to use. 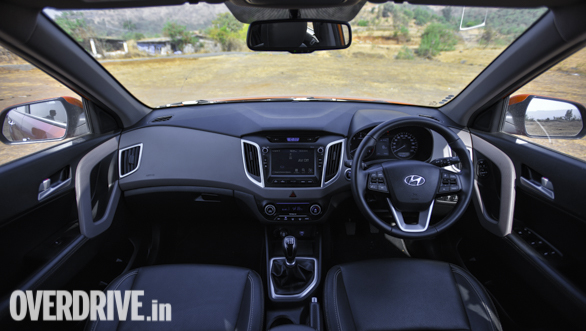 The Creta comes close to replicating this with its similarly thoughtful infotainment setup, comfortable seats, and quality. Having spent a lot of time in Hyundais over the past year, we found the layout and materials familiar to their other models. 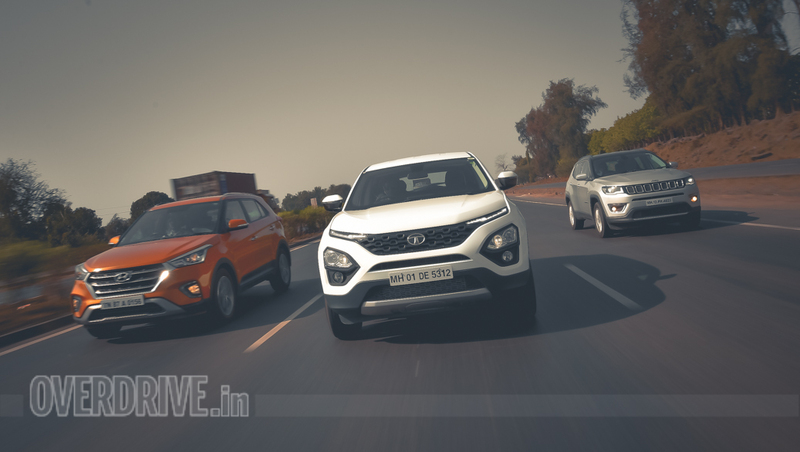 While both the Compass and Creta have comfortable rear benches, the Harrier takes the game forward by some margin. Its rear bench will seat three and in much comfort. The interior is well designed and finished in a mix of materials that look fresh. The layout with its big buttons is the best we have seen on a home grown brand. But many surfaces are hard to touch, and the wood-grain panel on the dash looks great but feels plasticky. 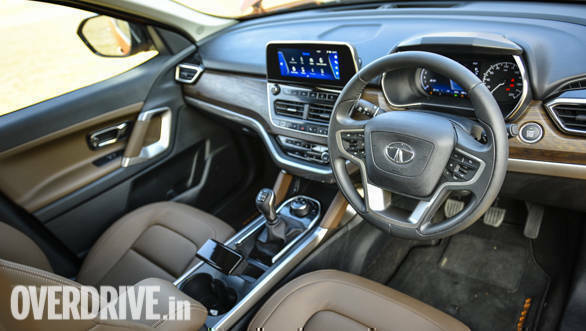 Quality too has improved but a few sections, like the grab rails around the centre console and the hand-brake which is an eye grabbing design element, still feel flimsy. The floating infotainment screen is crisp, if a little convoluted with its interface. The semi-digital instrument cluster brings novelty but we wish it was more functional. It doesn't provide any more info than the other MIDs here. We also would have liked for the tell-tale lights to have been bigger and the analogue speedo to have had a bit more flair. But if its space and a commanding view up ahead you want, look no further than the Harrier. 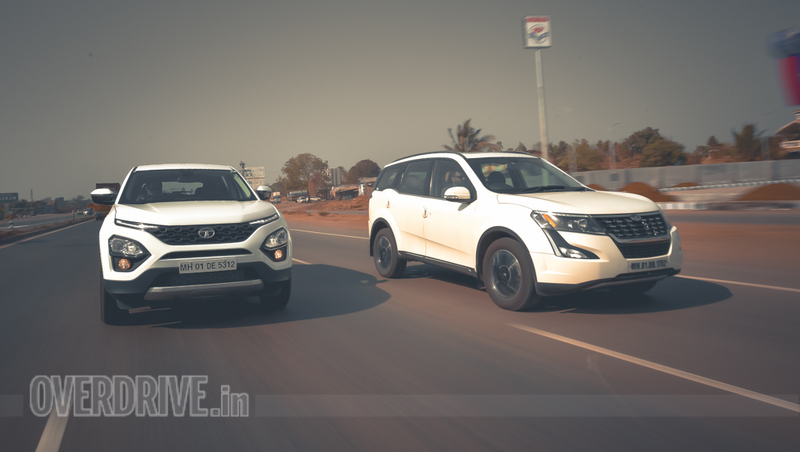 The XUV500 and the Creta's USP lies in their feature list. They're the only ones to get a sunroof and power driver's seat in the W11 and SX(O) trims seen here. The XUV500 adds a TPMS system to this. But our previous bugbears continue with the Mahindra. The layout and fonts are difficult to get used to and quality too is a concern. The quilted seats look great but are hard and not very comfortable both front and back. The XUVs biggest advantage however is that it is the only one here with seven seats, making it the most practical choice for larger families. On paper, there really is not much to choose between these SUVs in this regard. All get driver, passenger, side and curtain airbags in the trims we tested. Also available are ABS, EBD, HID projector lamps, hill descent control, traction control and a rear-view camera as standard. The Compass adds to this with an electronic parking brake and the Harrier and XUV500 with a hill-hold function. 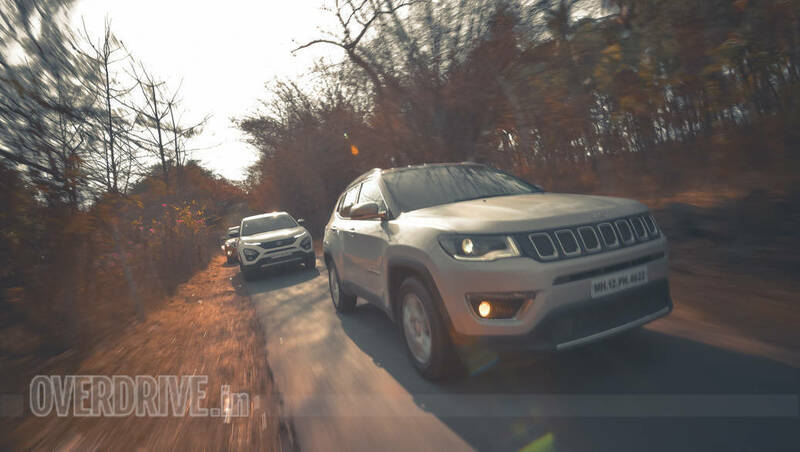 The Harrier and Compass both share FCA's 2.0-litre Multijet II diesel motor but in different states of tune. In the Harrier, this motor is detuned to make 140PS at 3,750 rpm against the Jeep's 173PS at the same rpm. And, both make 350 Nm between 1,750 and 2,500 rpm. Another disadvantage that comes up to downplay the Harrier is its kerb weight, which at 1680kg is more than the Compass at 1654 kg. These differences are evident as soon as you start driving the two SUVs. 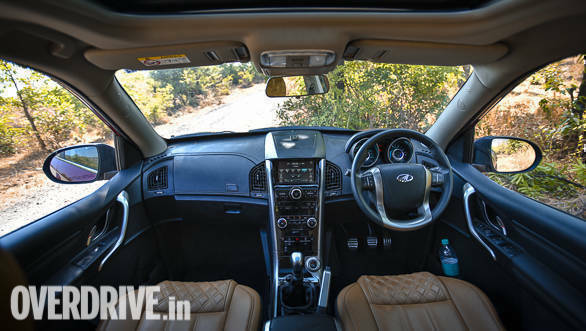 The Compass feels livelier, you get to keep up with traffic easily and make more confident highway overtakes. This is not to say that the Harrier feels underpowered, it's adequate for the most part, you just need to plan your progress a bit better to match pace with the Compass. 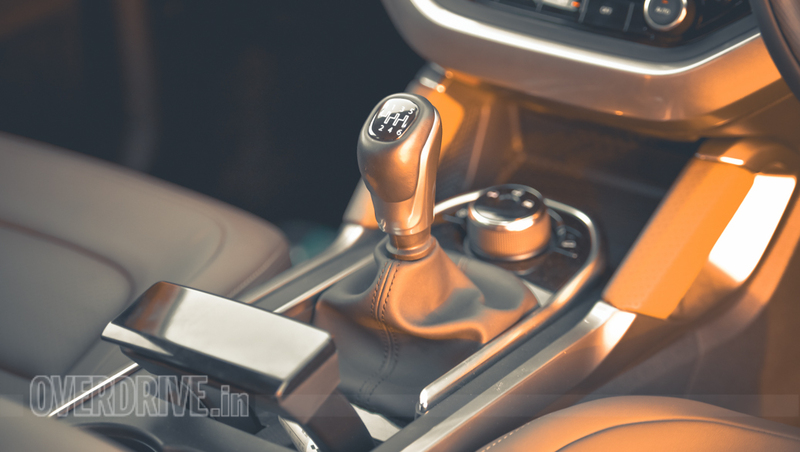 Both use the same six-speed manual which is crisp, if slightly long in its throws. However being manuals, these cars are always going to be a task driving them around in city conditions. Addressing that though is a slightly lighter and more comfortable clutch action on the Harrier as compared to the Compass. The Creta makes 128PS at 4,000 rpm and 260 Nm at 1,500 to 3,000 from its 1.6-liter diesel motor. This makes it look like the weakest here on paper. But the Hyundai is also the smallest and lightest of the bunch with its 1390 kg kerbweight. Consequently, it happens to be the quickest car here with its 10.9s time to 100 kmph. This can also be put down to what is the most responsive engine here. There's little turbo lag and the slick six-speed gearbox means you get to exploit most of the power quite easily. The XUV 500's 2.2-liter engine is the largest here and the torquiest with its 360 Nm at 1,750 to 2,800 rpm. It is slightly overshadowed by the Compass in the power department with its 157PS at 3,750 rpm. The XUV's engine has been around for much longer but is just as good as the others here where power and torque ratings and their delivery is concerned. 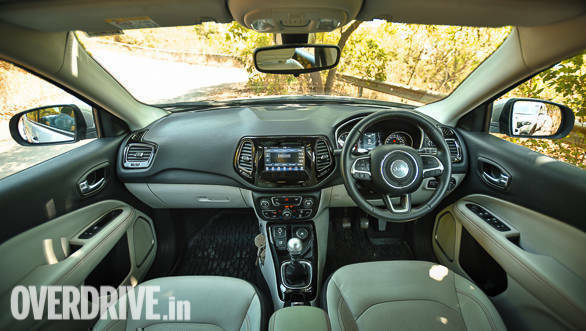 We only wish it were more refined or if Mahindra could add a bit more sound deadening and vibration dampers to make the overall effect more luxurious. It clatters quite a bit on start-up and is let down by the gearbox. The six-speed unit is not the most precise, a feeling accentuated by the long throws. Look at how efficient these cars are and unsurprisingly the lightest cars are the most efficient. The Compass with a 15.16 kmpl is the best overall, helped in no part by the quite astonishing 23.43 kmpl highway figure it achieved. It's city figure is par for the course at 11.62kmpl. The Creta is the most efficient city car with its 13.2 kmpl. The state of tune biased more towards city driving means that highway efficiency drops to the lowest here at 16.5 kmpl, but overall efficiency is still second best here at 14.19 kmpl. 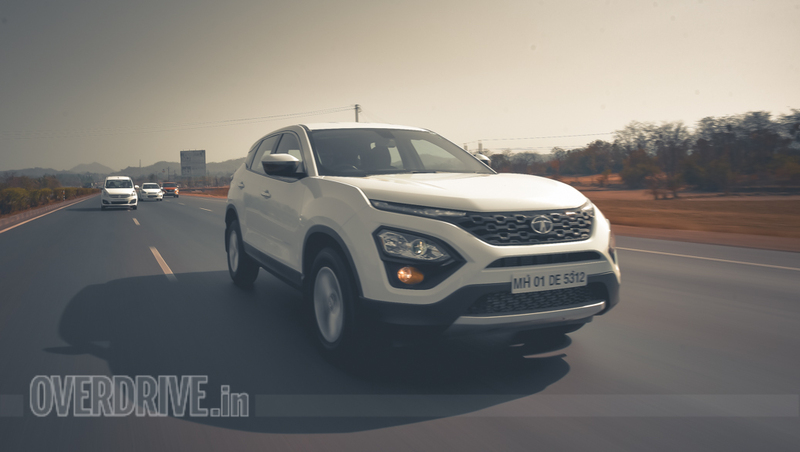 The Harrier's on the other hand beats the XUV 500 with its 13.81 kmpl overall figure. It's 17.87 kmpl also only bested by the Compass in terms of highway efficiency while its 12.07 kmpl city figure is bettered only by the Creta. 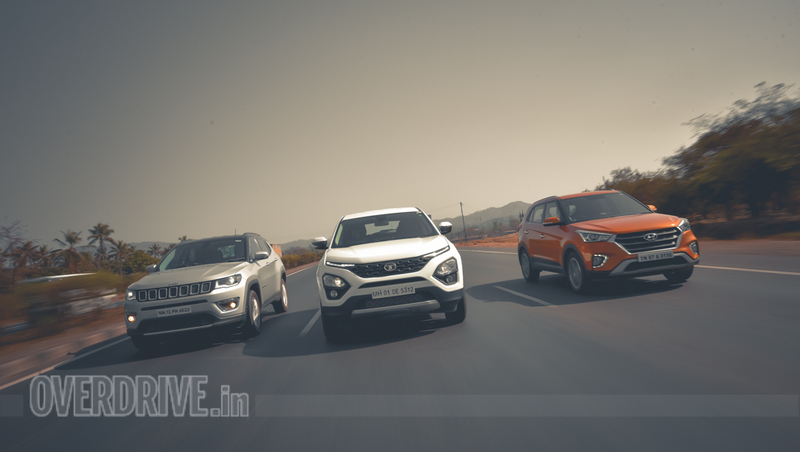 The XUV 500 is not entirely outgunned though, its 13.32 kmpl overall figure is not that far off from the rest of the pack, especially when you see its 17.28 kmpl highway figure. The Harrier's Land Rover derived architecture starts proving its benefits here. If it's back seat comfort you're looking for, look no further than the Harrier. Its ride quality is the best here. The SUV absorbs all manner of road imperfections without any drama. The high-profile tires which we didn't like for their looks, add a cushy feel unfelt on other cars. High-speed stability is also great and roll around corners is present but contained. The steering could have done with better feel though, it feels over-assisted on-center and doesn't weigh up much the more you turn it. This means that at regular highway speeds constant mid-corner corrections are the norm. Conversely, this also means that city driving is effortless for the most part. The Harrier is also the only one to get drive modes. These are basic though, only changing throttle response and some amount of steering weight. 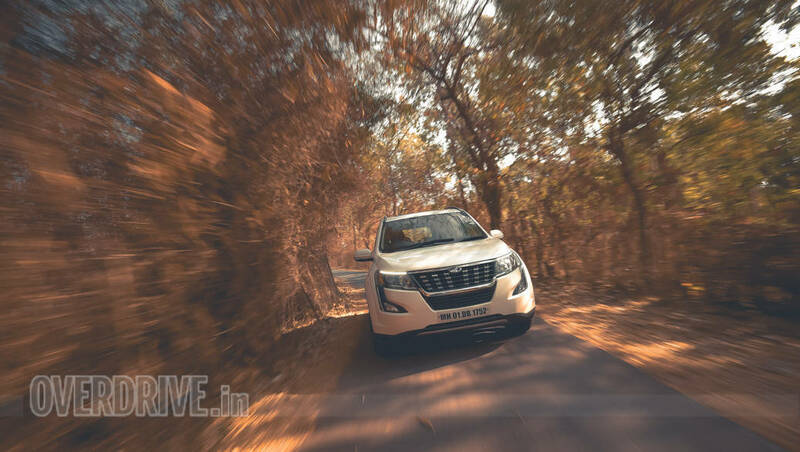 The XUV 500 is set up similarly but doesn't translate itself as well on the road. The car never really feels settled, it's bouncy at low speeds and when you start going fast, a sense of jitteriness creeps in. There is also a noticeable dive when you brake. Unlike the Harrier, the brakes don't feel progressive and are abrupt in their functioning. The Harrier, on its part, could have done with a bit more initial feel. The Compass strikes a fine balance and has a noticeable edge over rivals. Its multi-link setup means it's almost as pliant as the harrier but a sense of underlying tautness is always present. There is minimal roll and the Compass is great around bends, staying confident and providing enough feedback. The steering is good too. It weighs up confidently and you have a good idea of what the car is doing. 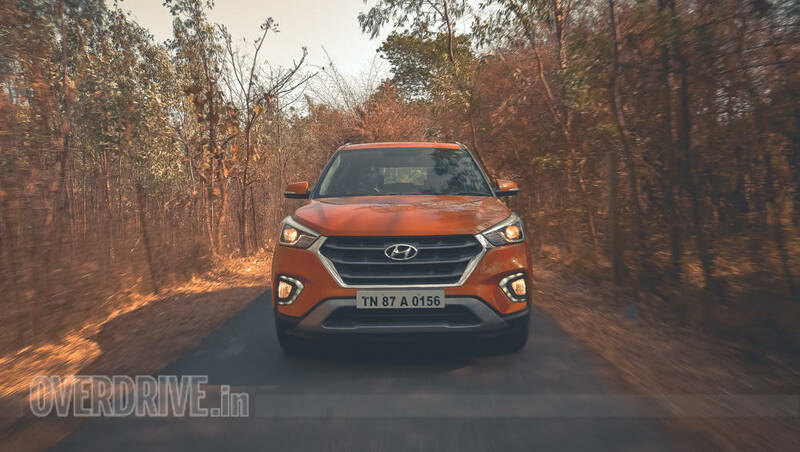 The Creta is also quite fun but is let down by a suspension that just stops short of being as pliant as the best here, there is some noise which shows itself over rough patches.The Hyundai feels stable on the highway and body movements are never unnerving. The steering weighs up as you turn progressively but could have done with more feel and a bit more heft on-centre. The Hyundai claws back ground when it comes to refinement. Wind noise is imperceptible and apart from some tyre and engine noise, is a serene drive. The Compass also feels as such. The Harrier could have done better. There is wind noise from the large mirrors and along the top of the door sills. Tyre noise is about as much as anything else here, but there could have been less noise coming from the engine. 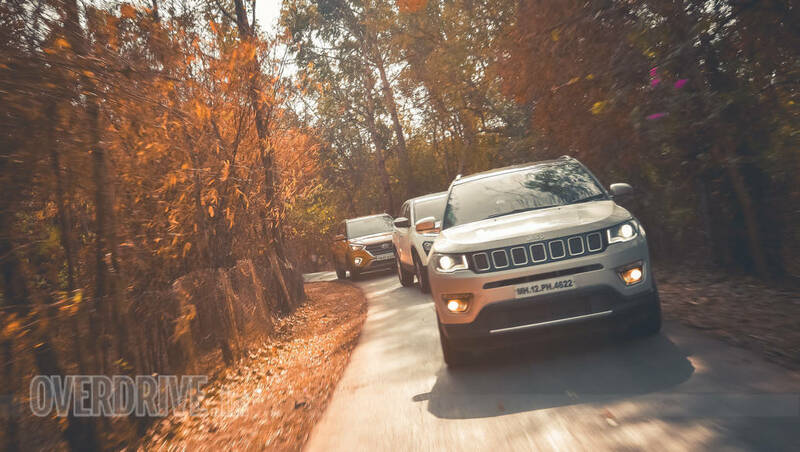 The Jeep Compass Limited(O) 4X4 we tested costs Rs 26.7 lakh on-road Mumbai. This makes it the most expensive car here by some margin. But this is a premium we would have no problem paying. The Compass hits the sweet spot with its styling, size, comfort, driving dynamics and brand value. It does some things better than the other here and most things almost as well as the best. 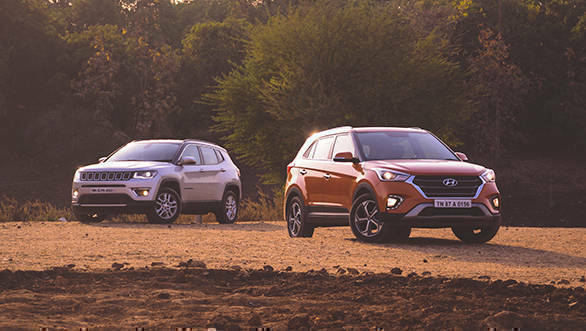 The Creta and Harrier present buyers with a dilemma. Costing, as tested, Rs 18.93 lakh and Rs 19.83 lakh respectively, they appeal very differently to buyers which their attractive pricing. 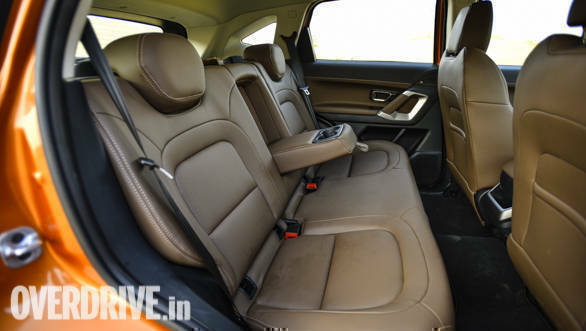 If its presence, space and rear-seat comfort you want, the Harrier is your SUV. The Creta gains where the Harrier falters. It feels refined and comes packed to the gills with features, in a package that feels bullet-proof. You lose space but gain agility. The XUV 500, understandably, has started to feel its age. All its rivals are much newer and have moved to advanced architecture and up-to-date designs. 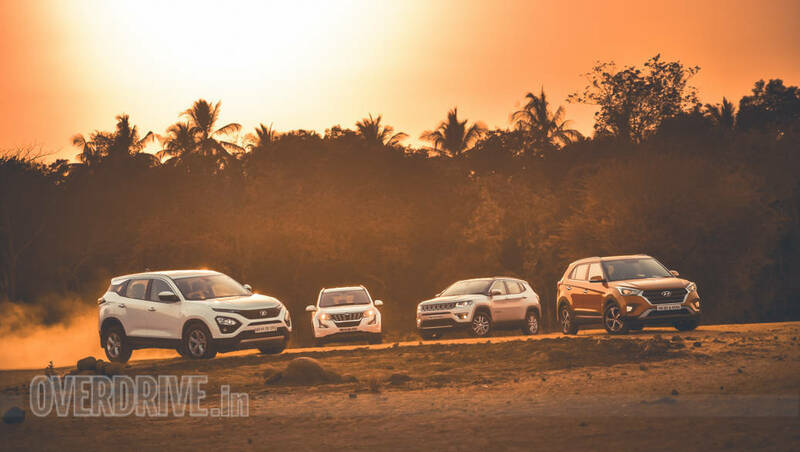 But to Mahindra' credit, the constant updates and long feature list work in its favour, keeping the XUV 500 within fighting distance of rivals. It's Rs 20.75 lakh price tag could have been trimmed down though. So which one's best? We will have to give it to the Compass, mainly because of the perfect balance of attributes it manages to achieve. The Creta is second best, on the back of its impressive feature list and strong pricing. The Harrier follows the Hyundai, its back seat and ride comfort means those being chauffeured around needn't look any further. But it stops short of being a perfect all-rounder. The Harrier is missing some crucial features and refinement has room for improvement too. The XUV 500 rounds off this bunch but still feels like a good package, its features and two extra seats makes sure of that. But you definitely pay for these things. But all these SUVs paint a larger picture. Buying an SUV is, emphatically, not a left-field decision anymore. There's something for everyone. 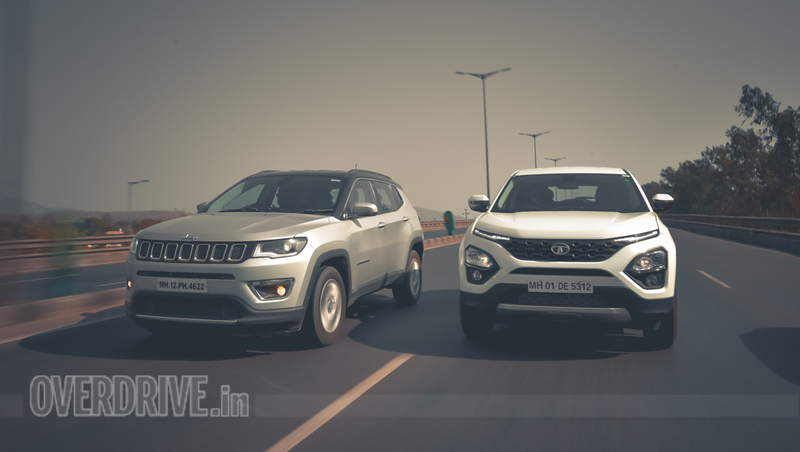 So whether you want a comfortable highway cruiser or something to hoon in, you can find an SUV that'll do it.